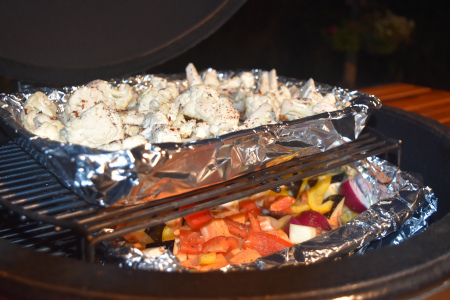 My kamado cauliflower couscous with roasted vegetables is a must if you love cooking on your ceramic grill, are vegetarian or vegan. It also makes the perfect accompaniment to many dutch oven meat stews - so does that make this recipe perfect for absolutely everyone?! Heat deflector stones in for indirect cooking, get your temperature up to 180°C (350°F) and all you need is a couple of roasting trays. The cauli doesn't take that long hence putting it in a separate tray. To finish off, I'm going to add some chilli sauce but you could add a Moroccan tagine; the options are endless. "Couscous is a dish, semoul is the component part that you're referring to." And having done my research he's bang on, couscous is a dish made of small steamed balls of crushed durum wheat semolina that is traditionally served with a stew spooned on top. So the bottom line is that this isn't a couscous recipe at all. 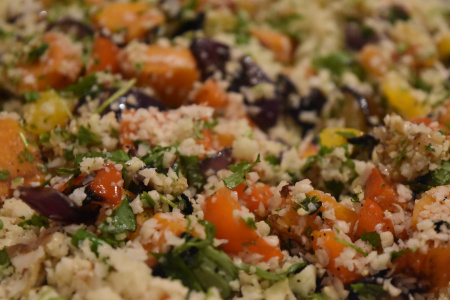 The roasted blitzed cauliflower vaguely resembles the "small steamed balls of crushed durum wheat semolina" (and some also refer to it as cauliflower rice) but for this recipe, kamado cauliflower couscous with roasted vegetables it is...just deal with it! 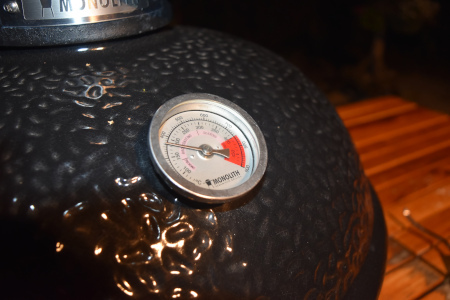 It's important that your grill is stabilised at this temp because if you put your veggies in too early and open the vents wide to increase the heat you risk flames licking the perimeter of the heat deflector stone and these could burn some of your veggies. 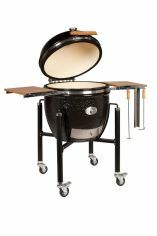 You'll need 2 roasting trays and I'm using a Monolith Classic with 2 tier cooking grate (the the grill expander in Kamado Joe language). You'll also need a food processor to blitz the cauliflower. All fresh ingredients so no allergens to worry about. Place the veggies on the bottom tier and the cauliflower on the top tier as this give the best balance for cooking time. Roast the cauliflower for about 20 minutes until al dente (take care not to over cook) and then remove from the kamado. Transfer the other veggies to the top tier on the kamado and roast for a further 10-15 minutes. 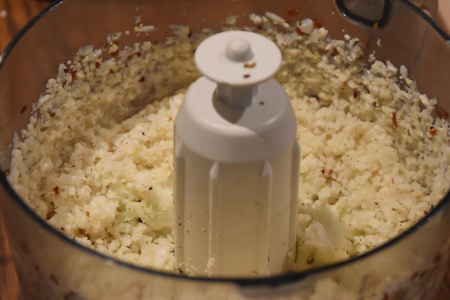 In the meantime tip the cauliflower florets into the food processor and use the pulse function to create a granular texture and take care not to mush. It doesn't matter if you still have a few lumpy bits, better that than end up with a paste. Transfer the cauliflower couscous to a warmed serving bowl, combine the roasted veggies and stir the fresh herbs, chopped garlic and chillies. Adjust seasoning to taste add a squeeze of lemon juice and lemon zest if desired. If you're vegan or vegetarian then spoon out and your favourite chilli sauce and your good to go. And if you're a meat eater then a lamb tagine is not too shabby an idea for pouring on top.